Since being acquired by the Philadelphia Flyers in the blockbuster deal that sent then-captain Mike Richards to the Los Angeles Kings, Wayne Simmonds has transformed himself into one of the NHL’s premier power forwards. Simmonds jumped onto the scene in his first season in Philadelphia, tying Claude Giroux for the team lead in goals with 28. He appeared like the absolute steal of the deal, cementing his spot in the Flyers’ top-six forwards and on the first power-play unit. When his deal was set to expire after the 2012-13 season, the Flyers inked the 26-year-old winger before the 2012 lockout, signing Simmonds to a six-year, $23.85 million deal. In what was considered a very team-friendly deal at the time, it’s becoming more and more obvious that Simmonds’ contract is one of the best bargains in the NHL. Looking at some recent deals that have been handed to power forwards, like the absurd amount of money the Toronto Maple Leafs handed David Clarkson in his seven-year, $30 million contract, the Flyers were able to sign Simmonds on the low-end of the spectrum. Paul Holmgren made some questionable deals during his tenure as general manager of the Flyers, but this move may have been one of his most underrated. In early parts of his career with the Flyers, a majority of Simmonds markers came within 5-10 feet of the crease, something Broad Street Hockey highlighted last year in a piece about the winger’s presence in front of the net on the power play. Simmonds is still doing that this season, but he’s started to expand his game. Simmonds has always possessed immense strength and good end-to-end speed, usually using those attributes to his advantage in dump-ins. But the winger’s displayed more of a complete package throughout the year, using his first goal of the season to give a little preview for what was to come this season. The power forward has made more of a conscious effort of carrying the puck across the blue line, and it’s helping him score in a variety of ways at even-strength. A majority of Simmonds’ markers at even-strength have come off the rush, and the winger has used his underrated wrist shot much more effectively this season. It’s been a silent crawl, but Simmonds has inched into “one of the best bargains in the NHL” territory. Not only is Simmonds tied for 17th for total goals scored since 2011, but he also ranks third in power-play markers (44) during that span. 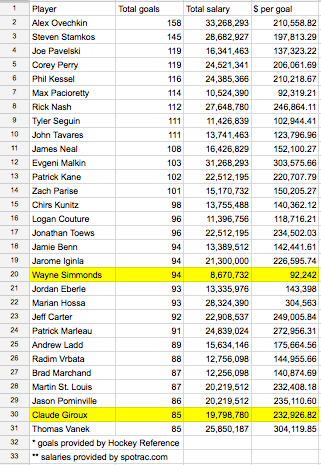 Looking at the top-30 goal scorers and their total salaries over the last four seasons (not AAV), the Flyers are getting the most bang for the buck with Simmonds. This list doesn’t include players from the 2011 draft and on, due to the fact that most of their salaries aren’t much more than $900,000 — if that. Even so, only one player — Gabriel Landeskog — cracks the top 60 in goals scored. The extension he signed with the Colorado Avalanche kicks in this season, but with rookie wage scales, it’s not as if the Avalanche had a chance to overpay him and make him less valuable. That being said, with a plethora of bad deals along the blue line, this contract remains to be a breath of fresh air for Flyers management. As Simmonds continues to grow into a more complete player, the the 26-year-old is going to look like one of the best bargains in the league.